This first floor, oceanfront villa features fantastic ocean views. 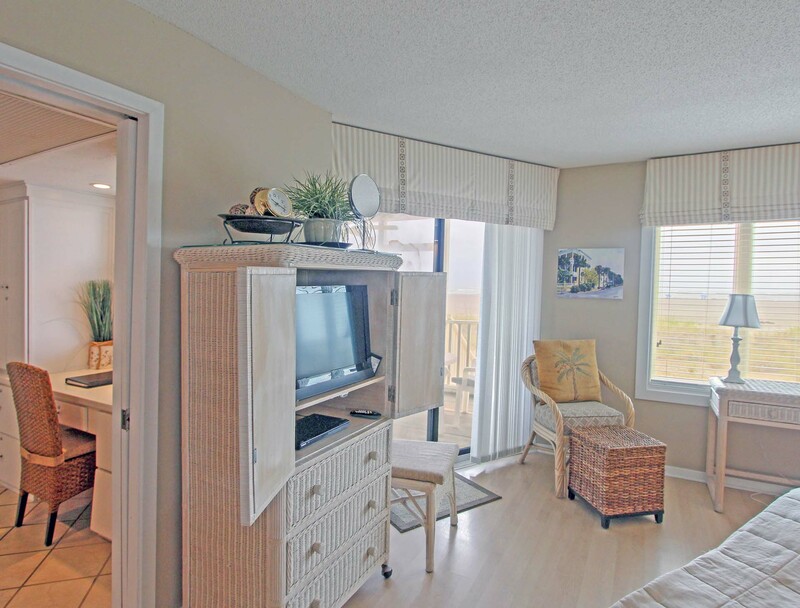 Enjoy easy and direct beach access from your private screened porch directly onto the beach. 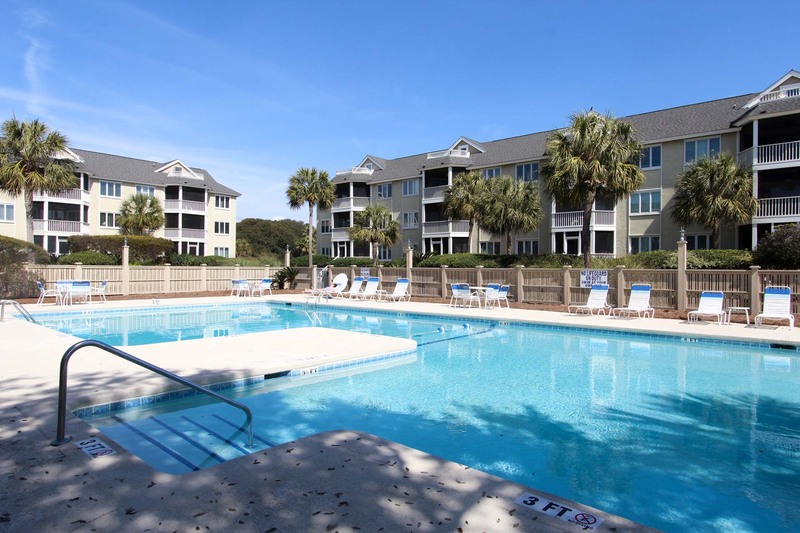 Enjoy the best of both worlds, lounging by the community pool with great ocean views. 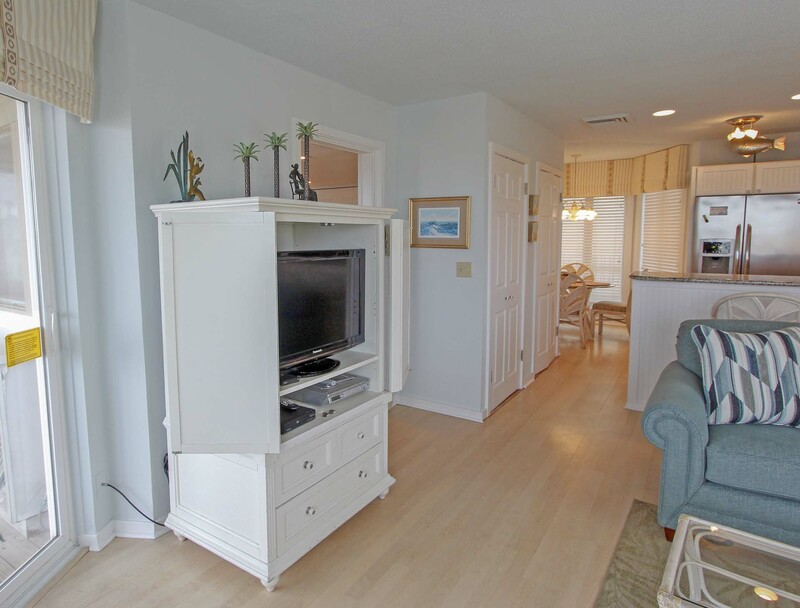 The living room features hardwood floors, flat screen TV with a DVD player, and access to the deck and screened porch. 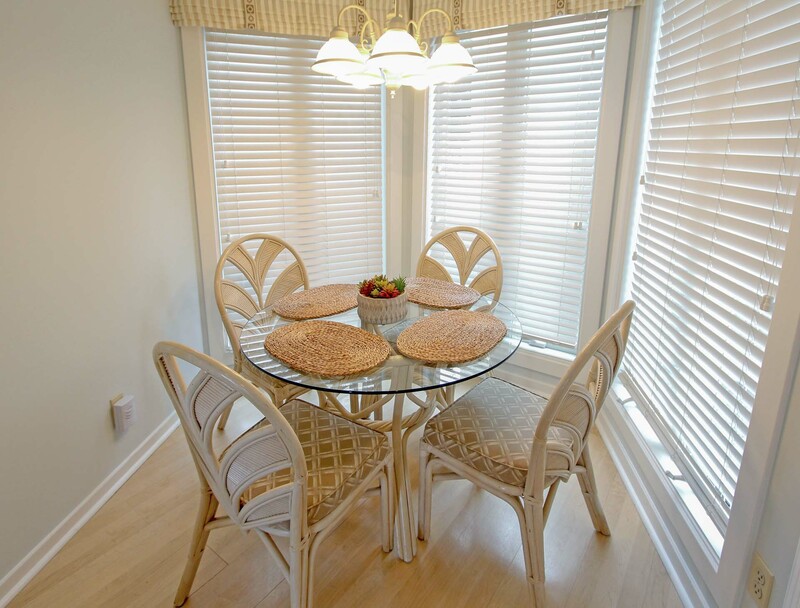 Seating on screened porch allows for lounging or dining. 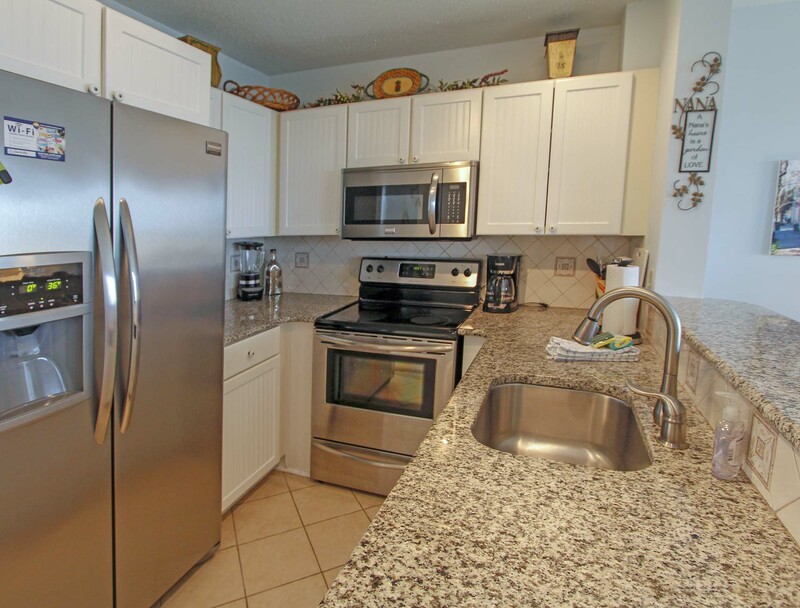 The kitchen offers amenities like granite counters, stainless steel appliances and tile floors. The counter offers seating at the bar. The dining room, which seats four, opens onto the kitchen. 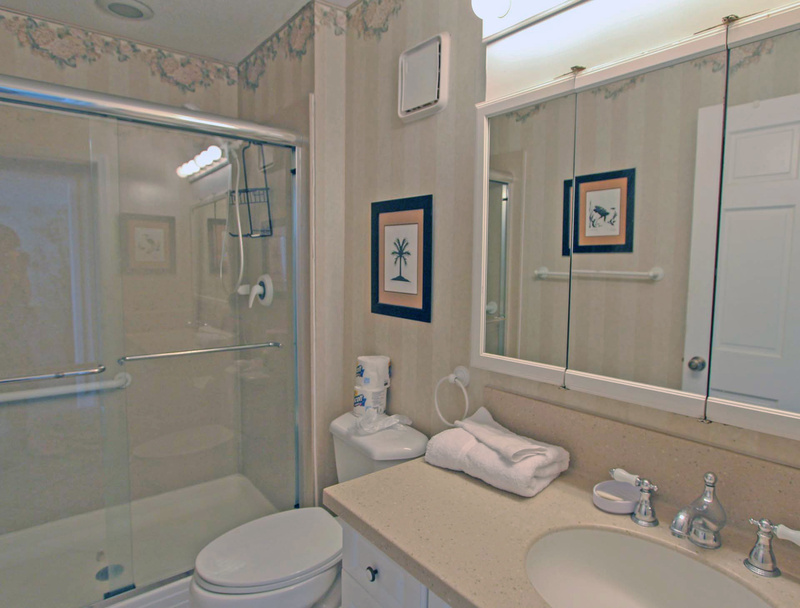 The master suite is furnished with a King bed, TV, and DVD player. Each Port O'Call Villa includes: free parking, screened porch, elevator access, free access to community swimming pool, initial supply of linens and towels, washer and dryer, cable TV, air conditioning, starter supply of paper products and detergents, fully equipped kitchen with dinnerware, flatware, pots and pans, plus local telephone service and 24-hour security in a gated community. The wireless service requires a login and password. Contact the front desk about the login information. Wireless internet services are not guaranteed to work with your equipment. We cannot provide support for guest's personal computer systems. Motor homes, trailers, boats and motorcycles are not allowed in Wild Dunes Resort. Dining room with seating for 4, and 2 additional seats at kitchen bar. Nice unit with updated kitchen and living room. 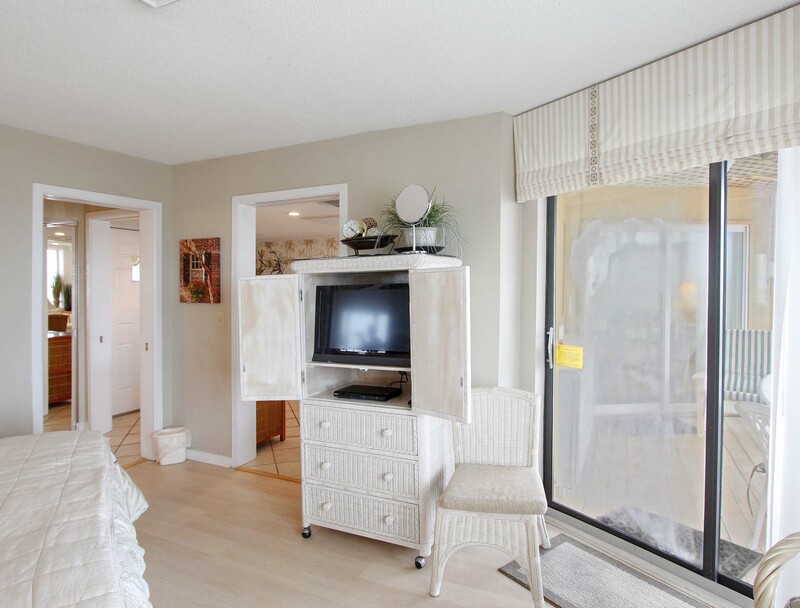 We had ocean views from every room with the end unit. Only thing needed was a updated patio set instead of the plastic table and chairs. 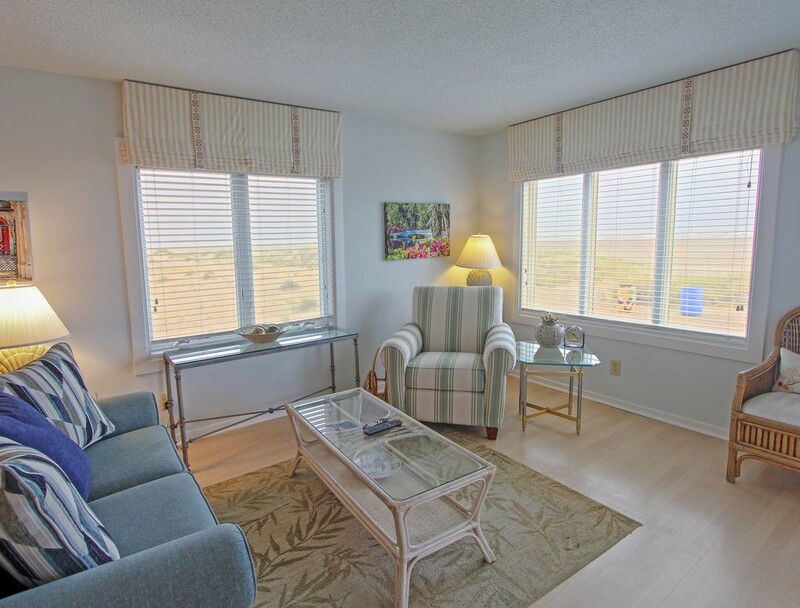 Our stay at Wild Dunes, Port O' Call B104 was very enjoyable. The condo was just about perfect. You can lay in bed and watch the sun doesn't get much better than that. My only complaint was the front door. It was very hard to unlock with the key. I think that issue needs to be addressed. Thanks to the owners for sharing their condo! It was beautiful and the location was perfect! The stash of an extra bedspread and pillows in the bottom of the only closet made it difficult to hang anything. My wife and I had a great experience staying in Wild Dunes. It is a great area with a lot to do. There are enough restaurants and activities that you don't even need to leave the resort if you don't want to. Our condo was steps to the water. You could not have a better spot than this condo. The inside of the condo was fine. It was relatively clean when we arrived. The bathroom needed a little extra attention. The screened in porch was a major disappointment. The wood was rotting and it leaked when it rained. The furniture on the porch was weathered and dirty. We had a ton of rain during our visit so I would have appreciated a warning from the owner that our stuff would get wet. I would recommend confirming the laundry is in working order before your arrival. We planned on having laundry services and the dryer was not in working order. We did receive a credit from Eric at Island Realty for inconvenience which was very nice. Eric from Island Realty was really great to work with. We had an issue with the first property we rented and VRBO was useless and horrible to deal with. Luckily Eric was there to help us and moved us to Port O Call. I will use Island Realty again but I will never use VRBO again. 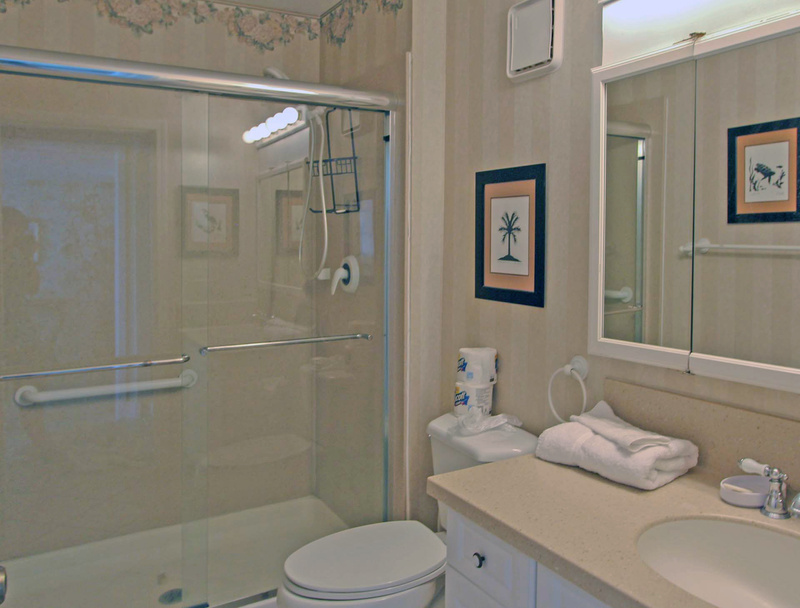 Port O Call Unit B104 was an exceptional rental unit. 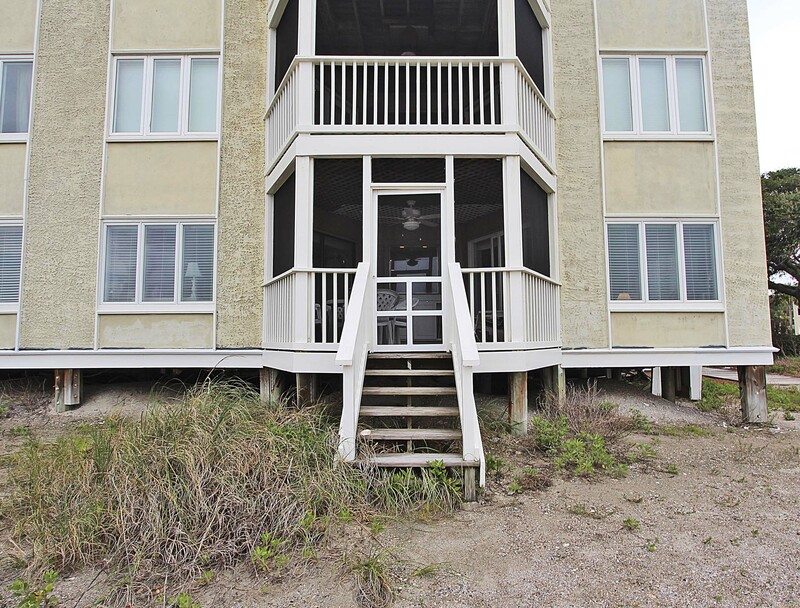 The property was as described, situated beachfront with the ability to walk down the porch steps right into the sand. The steps could have been finished so that the last step was not too high off of the ground. Also the vegetation had grown up into the steps and was annoying, but passable. This particular unit was remarkably clean upon our arrival and aesthetically pleasing with updates in the kitchen and living spaces. 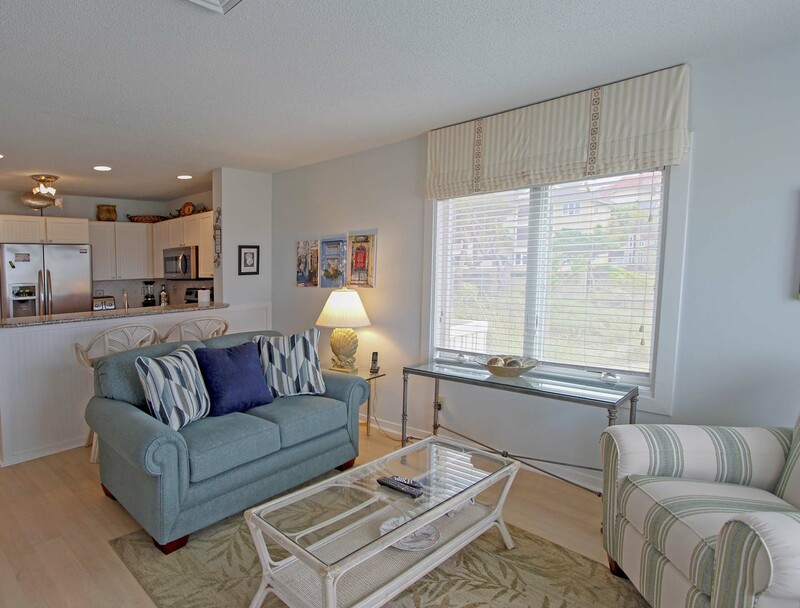 The furniture in the living area was new and the condo was very comfortable overall. There was a washer and dryer suitable for two people, however the dryer was broken while we were there although a work order had been placed before we even arrived to have it fixed. Unfortunately it was not fixed during our stay. Overall we would recommend this unit as the location and views were spectacular! Since this is a corner unit, the additional sunlight from the side windows was an added bonus. We also enjoyed the pool, which was located right next to the unit. The beach was not overly crowded and was very private compared to IOP. We enjoyed walking straight out of the condo onto the beach each morning to have our coffee and watch the morning tide and sunrise. Chairs and umbrella were provided by Chunky’s Chairs and Umbrealls – which were setup directly in front of our unit early every morning. We were only a short walk back to the condo to cook when we were ready to eat. We also recommend dining at Acme, a local favorite. Sullivan’s Island should be on your list of must visit places while on vacay. We also love visiting Patriot’s Point and the newly renovated marina there. This was the perfect location, right on the beach, for our weekend getaway. The screened in porch with the ceiling fan on was my favorite spot for morning coffee and afternoon naps. We will definitely be staying here again. Couldn’t ask for better accommodations. This was the second year in a row we stayed in this condo. It was absolutely fantastic. Island Realty makes the whole experience easy. Additionally the Wi-Fi signal was very weak and would fade on and off. We called the provider and they could not fix it remotely. Thank you for your comments. The owner has taken them to heart and has done some repairs and updating including buying new living room furniture. It should hopefully be delivered in the next few weeks. 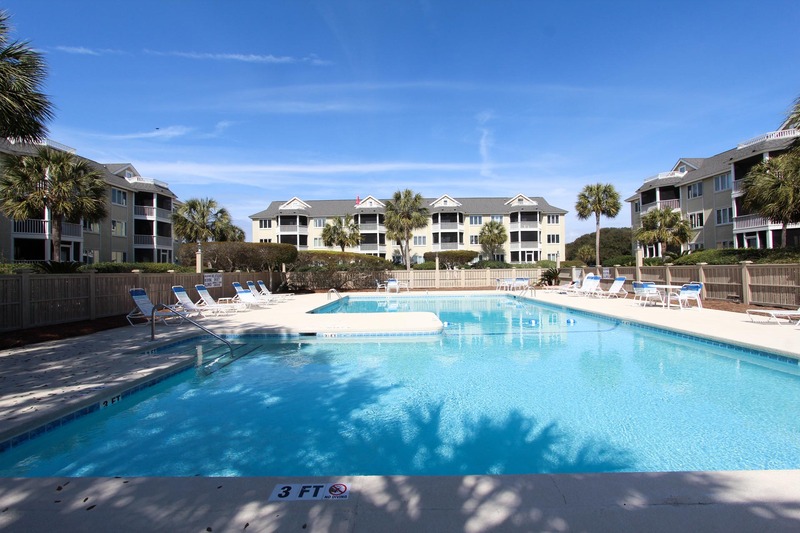 Spent Monday-Friday at IOP in Wild Dunes, Port O Call. Always love the beach there and Wild dunes in particular. The unit is a fantastic location but sorely needs an update! New paint would be nice and get rid of so much "stuff" that's sitting around! Thank you for your comments. The owner did put on a fresh coat of paint throughout and updated the living room furniture this past April. You could not pick a better location for staying at the beach. Walk out the back door and there you are ready to enjoy the sand, ocean, etc. Easily see the sunrise from the screened in porch. This unit is very nicely furnished and the kitchen supplies are more than adequate. Lots of gorgeous hanging pictures. There was a perfect desk area where I could easily plug in my Ethernet cable. The TV cable service only has SD channels (i.e. no HD). That is a bit unusual these days, but we rarely watched TV anyway since the weather was so nice. Five stars would have been selected if it weren't for the roach infestation. (They looked like water bugs to me. I thought they were too big to be roaches, but my wife said they were. Since she is a Biology major, I believe her.) In any case, until the last day, I only saw dead ones. When I informed the Island Realty agent when we checked out, she did not seem particularly concerned. She said they usually spray once a month. Clearly, that should be more often. Extremely nice condo. The furnishings were comfortable and first-class; even the artwork was lovely. We loved walking out from the back porch and being on the beach. The porch was also a lovely place for meals at home. The down sides were that when it rained, the porch leaked (a lot) and the blinds in the bedroom wouldn't close. We would have loved to sit on the porch on rainy days. I reported the blinds to management and they said they had a part ordered. However, these had been broken for a while and when you're on the first floor where many people pass by on the way to the beach, it ruins privacy. I felt they should have replaced the blinds. All in all, we enjoyed our stay very much and would stay again if the porch and blind problems are corrected. Thank you so much for your comments. We are so glad to hear you enjoyed your stay. The part for the blinds has come in and been installed and the blinds should be working properly now. We look forward to seeing you again soon. Our stay was beyond our expections! The location was perfect...the rental was beautiful, very clean and comfortable. The grounds were manicured and the surroundings were secure and safe. A totally pleasurable experience! Loved Port O Call B104! Love Port O Call B104! Thank you so much for your comments. We look forward to seeing you again soon. Wonderful location with great ocean views form all angles. Great getaway for a couple. Wife and I loved it. Property description was accurate. The unit is a little dated, but it was very clean. All the appliances worked. Unit was steps away from the water at high tide. Could use an extra bug treatment on the screened porch for sand fleas and inside for roaches.